Inflatable kayaks are quite popular nowadays in the boating industry due to their portability and ease of use. They are usually affordable and offer a great way for families and friends to spend time on a weekend by the river. You can easily fold an inflatable kayak to fit in the trunk of your car, backpack and box for easy transport and storage. The portable and compact design of these kayaks makes them a versatile choice when families want to go fishing or spend some recreational time in the waters. However, the market is filled with different models making the selection process a little difficult. You need to go through several models on the market to find one that best suits your needs and desires. Luckily for you, we’ve done our research and bring you the best inflatable kayaks on the market right now. Our reviews have selected from the top brands on the market that rarely leak and will serve you for long. They are made of tough materials and best placed to offer you excellent value for your money. Go right ahead and choose one from the list below. 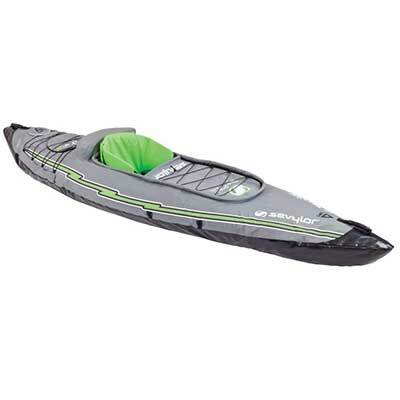 The Intex inflatable kayak is one of the best on the market comfortable for all persons. It is a two-person kayak with adjustable seats and backrests. The kayak seats come in a cockpit design for maximum comfort. It is a well-sized kayak measuring 20 x 36 x 123 inches. It also has a weight capacity of 400lbs. The kayak features a removable skeg that allows for directional stability. 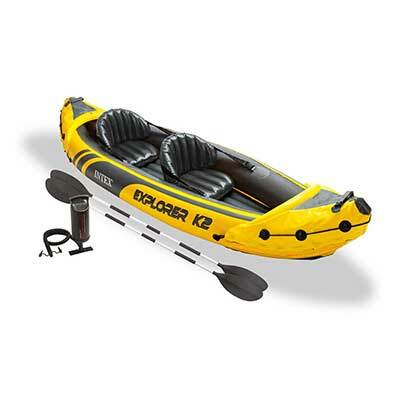 It is a high-quality kayak that comes in bright yellow colors for increased visibility. This kayak is an ideal choice for small water bodies like rivers and still rakes. 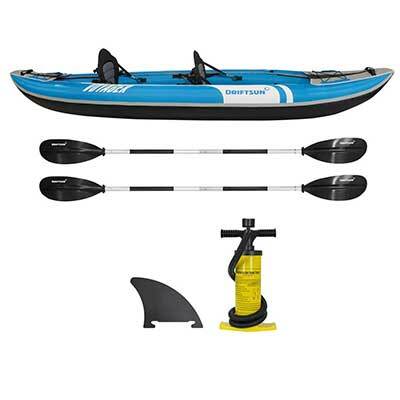 It comes with a set of aluminum oars and a pump for immediate use. Increased visibility due to bright yellow colors. This is a nimble durable kayak made of the highest quality welded materials for long-lasting use. 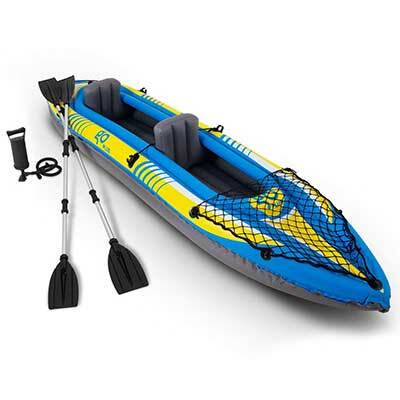 It is a one-person kayak with eye-catching graphics that will make you stand out in the rivers. The graphics also make you highly visible in the waters for added safety. It features a roomy and comfortable cockpit with I-beam inflatable floors that adds the kayak stability. There is a cargo net on the front side to help you store your gears. The seat is also inflatable and comes with a backrest for added comfort. 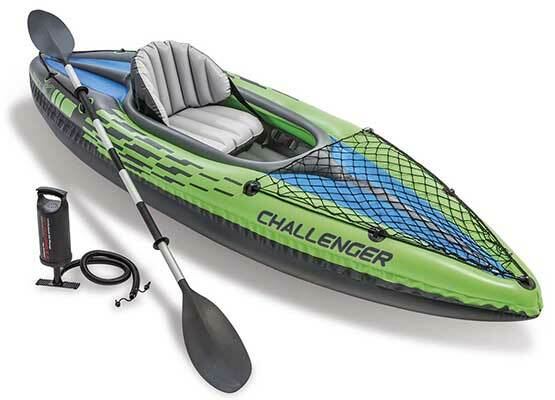 Overall, this is one of the best one-person kayaks out there 84-inch paddles and air pump for immediate use. It also supports a maximum weight of 220 pounds which is pretty good. The Sea Eagle inflatable sports kayak is by far one of the best 3-person kayaks on the market. This is a sea monster that works best for kayak sports. It can hold three persons with a maximum weight of 625 pounds making it by far the strongest kayak on the market. It is comfortable and pretty easy to use. The kayak features inflatable and adjustable seats. The seats can also be removed for the kayak to work as a two-person kayak. There are two skegs at the bottom of this kayak for excellent speed and direction control. It also features the five deluxe one-way inflation and deflation valves. This allows for easy opening and draining. 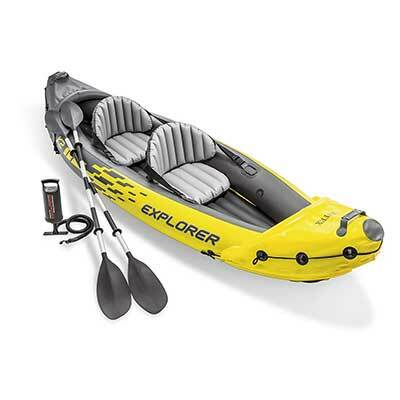 Overall, the kayak comes with a pump, two oars and a carrying bag for convenience. 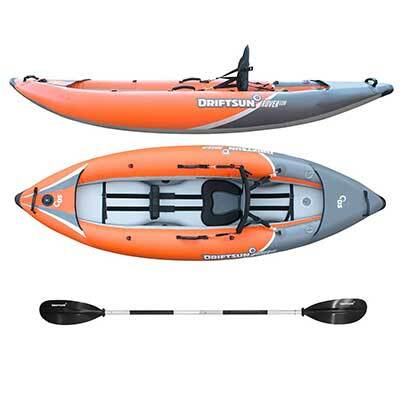 This is another high-quality two-person kayak with built-in rib frames the help in the tracking by defining the stern and bow. It is a pretty durable and strong kayak made of three layers to prevent unnecessary punctures. It comes pre-assembled from the factory for immediate use. The only thing you need to do is unfold, inflate and you’re ready to enjoy quality times in the waters. This kayak is also pretty comfortable and features adjustable seats. The seats are also padded and feature a backrest for excellent support. There are three seat locations to allow for solo or tandem paddling. 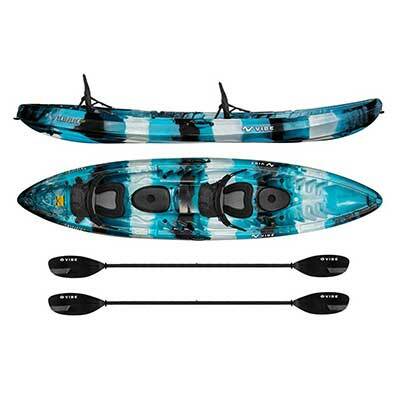 The Driftsun Voyager kayak is another top- selection that inflates pretty fast to full-size. It comes with a double flow pump for faster inflation in less than 5 minutes. This is exactly what you need to get to the water fast. It is a highly portable kayak that weighs 27lbs. The compact design allows for easy carrying from the garage to rivers in your trunk. The construction of this kayak is the durable and heavy duty Tarpaulin bottom PVC material. It also features double threaded Boston valves that prevent leaks. The outer part of the kayak is the nylon Oxford cover which is torn and rip resistant. Overall, this is one of the best kayaks on the market with a low profile design for superior performances. It features high-quality EVA padded seats and backrest for long-hour sitting. 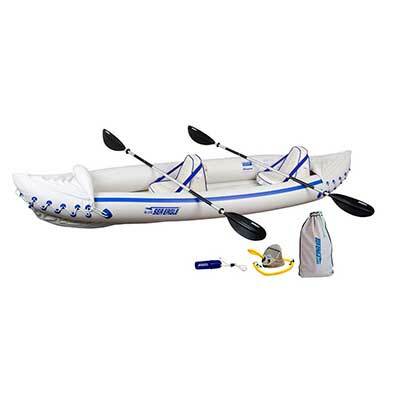 This is another top-rated Intex inflatable kayak to give you the best times in the waters. It is a big brand in the industry and one you can buy with confidence. This is a quality 2-person kayak with two spacious seats for maximum comfort. The kayak is perfect for mild water and lakes. It features rugged 3-gauge vinyl construction for long-lasting durability. The seats are inflatable and easily adjustable to offer comfortable sitting for long hours. The i-beam floors are also inflated adding to more stability in the waters. This coupled with the inclusion of all necessary accessories makes this a must-buy kayak this year. The Sevylor kayak is an advanced design with an easy 5-minute setup and easy backpack system for easy transportation. The kayak features a backpack system that turns into seats for easy transportation to the water bodies. It also easily sets up in less than 5 minutes for immediate use. 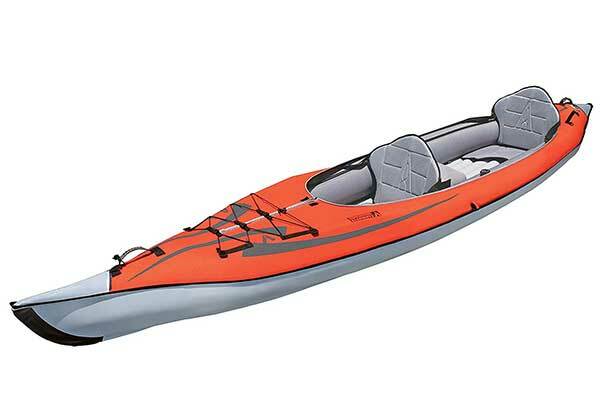 The kayak features a durable 14-gauge construction for long-lasting use. You will not experience frequent punctures like most common kayaks. Multiple air chambers allow users to remain afloat even with a few punctures. Overall, this is an airtight system kayak that will not leak when in the waters. It features double lock valves for easy deflation and inflation. The Vibe Kayak is a three-person kayak 12 ft long and weighing72 lbs. The kayak is a perfect choice for friends that want to fish together. It can hold a maximum 500 lbs. The kayak comes with two flush mount rod holders with mounting caps to keep your rods close. It is a pretty versatile kayak with multiple storage options. Two sealed hatches are featuring a cup holder and further safe housing to store other items. It also features bungee tie down straps to tie bigger cargos. Carrying your paddles overboard will not be a problem anymore with two paddle parks. Overall, this is an excellent inflatable kayak with four carrying handles to help you carry it out of the water. This is another pretty safe two-person kayak with three separate air chambers to remain afloat even with one side leaking. It is a great selection that comes with adjustable seats to offer the right amount of space and comfort. The kayak is quite durable and can hold a maximum load capacity of 350 pounds. It inflates easily using a simple hand pump for immediate use. It comes weighing a mere 17 pounds making it pretty easy to carry. Overall, this is one of the best kayaks out there with a streamlined design for excellent speeds. Paddling for an exciting family moment in the waters is easy. This is a pretty durable and lightweight inflatable kayak weighing a mere 22 pounds. It features a durable 1000D reinforced PVC layer construction for long-lasting use without leaks. The kayak bottom is highly protected from punctures due to the heavy-duty Tarpaulin bottom. It is stable and easy to maneuver with a high-pressure rigid floor. There is also a removable water tracking fin for better control and stability. Overall, this kayak is your ideal choice with adjustable seats to suit different persons. The seats are also EVA padded for maximum comfort when sitting for long hours. Here are some of the considerations to make when selecting the best inflatable kayak for use. Do you to go kayaking yourself with a friend? Kayaks are designed for one or two persons. However, some kayaks can fit up to three people. The choice really comes down to what you want. If you’re not sure of getting another paddler, go for one designed for two people but with an option to adjust the seat for one. The best kayak for calm rivers waters will not be the best for fast moving ocean waters. For those that plan to use their kayaks at the ocean bay, choose a kayak that allows you to sit inside. This one is pretty obvious. Taller and heavier people will require bigger kayaks with more weight capacity. Take a keen look at the kayak specs and choose one that will best suit you. You need to choose a durable kayak made of high-quality materials that will serve you for long. Most kayaks are made of PVC, Hypalon shells and Nitrylon. PVC is usually the most effective but one prone to punctures. Nitryon, on the other hand, is durable, water-resistant, tough and stronger than the PVC. Hypalon shell material is the best. It is stronger, UV-resistant, and longer-lasting than PVC but pretty expensive. Know your budget and choose a good kayak that falls within your budget range. These are the best inflatable kayaks on the market currently and best suited to offer you excellent value for your money. The kayaks are highly rated and offer excellent value for your money. They are longer-lasting and will serve you for long without frequent punctures. Make sure you only buy after reading our reviews to get the best quality possible within your budget.